I had been looking forward to going to The Cinnamon Snail for a long time! I had seen many pictures of their burgers and donuts on Instagram so I knew exactly what to expect. If I had more time in New York I’d definitely be back time and time again because there’s so much on the menu I want to try. We went for an early-ish dinner before a show and it was getting quite busy. 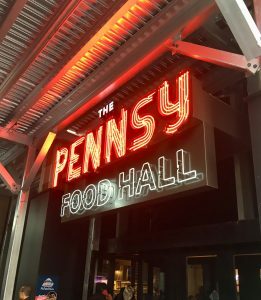 It’s in the Pennsy food hall in Midtown (you know I love a food hall) and I did manage to nab a table for two while Billy was ordering. Right after we sat down there seemed to be a massive queue so it’s lucky we got there when we did because we had a show to get to after. 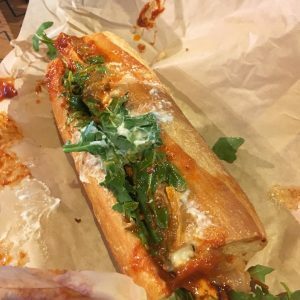 Billy had the special which was a something along the lines of Creole tofu baguette. It was incredibly messy but we both decided it was the kind of food you just had to let become a mess and clear up later. 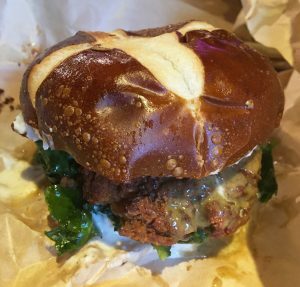 I had the smoked sage sent an burger which had marinated kale, mac and cheese, coconut bacon, sage sent an ‘sausage’ patty and roasted garlic aioli in a pretzel bun. It was so tasty and I could taste every element of it. I loved the mac and cheese in it. You might think it would be weird but it added texture and flavour. I even liked the kale which I’m not usually a fan of. They have a great selection of cakes and donuts. I have followed the person who makes them on Instagram for a while because they make beautiful cookie toppers with intricate piping on. 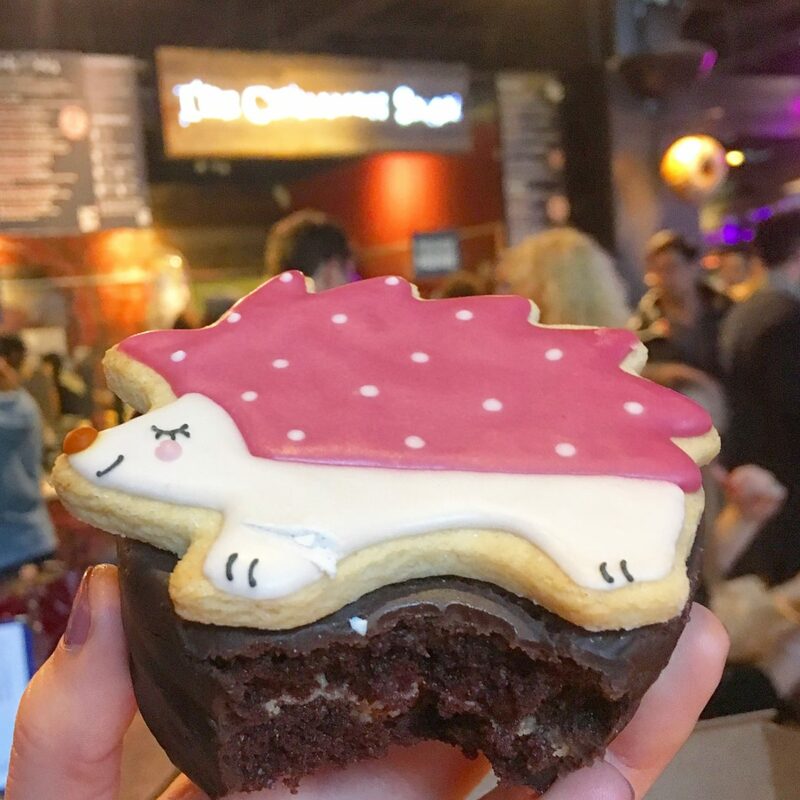 I chose mine just because I like to hedgehog cookie on top but I was so lucky that not only did it turn out to be chocolate and peanut butter flavour but it was delicious too! 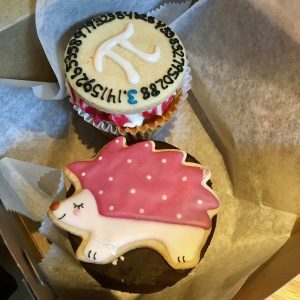 Billy had a cupcake that had a Pi day cookie on it. I can’t believe how neat the decoration is. My cake is probably my favourite thing I ate all holiday. I’ll definitely be going back to New York and the Cinnamon Snail will be the first place on my list to visit! 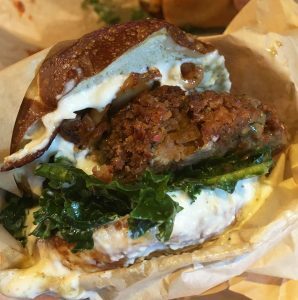 If you are on the look out for vegan food in New York you can read about my lunch at By Chloe.